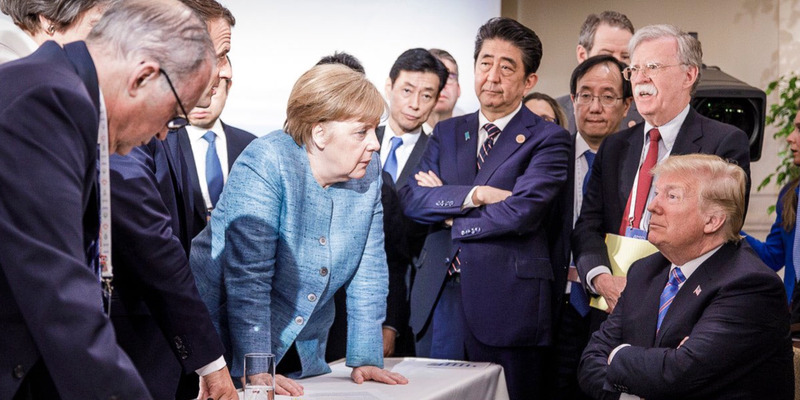 German Federal Government/Jesco Denzel via Associated PressGerman Chancellor Angela Merkel, center, speaks with President Donald Trump during the G7 Summit in Quebec, Canada, June 9, 2018. Ahead of the NATO summit in July, President Donald Trump’s advisers were worried about another clash like the one that took place at the G7 in early June. To head off a potential showdown, White House advisers pushed NATO officials to finish a final agreement before the summit even began. Trump was only shown a broad outline of the directive, rather than the full text, which o fficials on both sides of the Atlantic praised. Just weeks after a G7 summit that was described as a “burning tire fire” and ended with President Donald Trump refusing to sign a communique negotiated by leaders there, Trump’s advisers faced another international summit with a group for which the president had clear disdain: NATO. Seeking to avoid another international imbroglio, Trump’s advisers looked for away to prevent him from upending the formal agreement that usually comes after intense, down-to-the-wire talks among members of the alliance. The advisers, led by national security adviser John Bolton, instead pushed to have the agreement concluded before the president even left the US for the July 11 summit, five US and European officials told The New York Times. 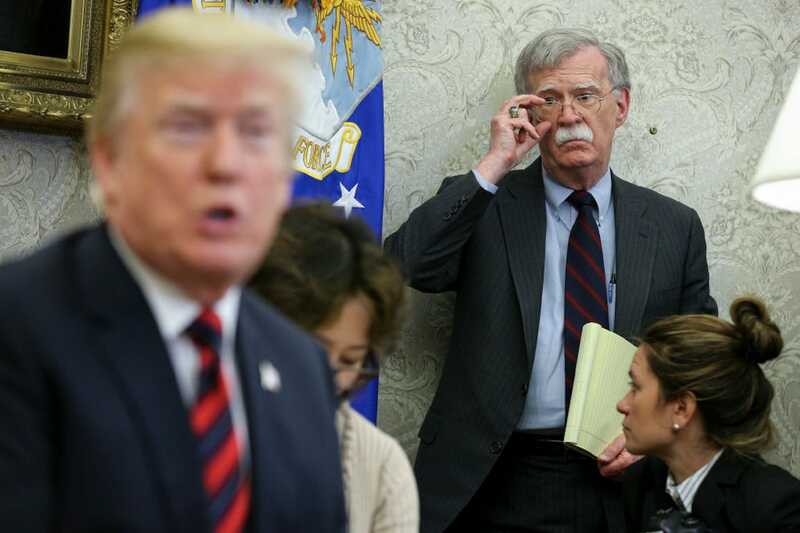 Oliver Contreras-Pool/Getty ImagesTrump speaks as national-security adviser John Bolton listens during a meeting with South Korean President Moon Jae-in, at the White House, May 22, 2018. NATO Secretary General Jens Stoltenberg backed the plan, telling ambassadors on July 4 that the usual wrangling over the agreement – renamed as a directive rather than a communique for this summit – had to be avoided. Stoltenberg asked NATO officials to have work finished on it by 10 p.m. Brussels time on July 6. And the officials, anxious over the potential for another Trump blow-up during the summit, agreed, according to The Times. Secretary of State Mike Pompeo and Defence Secretary Jim Mattis also wanted to avoid another showdown like that at the G7 meeting. Work on NATO communiques usually takes months, with discussions often coming down to the wire, as various countries use the looming deadline as leverage to advance issues important to them. In past, US leaders have reviewed last-minute revisions, as President Barack Obama did at the 2016 summit in Warsaw, The Times reported. This year, however, Trump was only presented with a broad overview of the directive and not the details of the document that stretched 79 paragraphs over 23 pages. 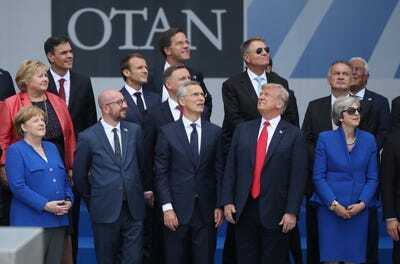 Sean Gallup/Getty ImagesTrump and NATO leaders at the 2018 NATO Summit in Brussels, Belgium, July 11, 2018. Securing an agreement allowed US officials to assure the public and other leaders of the US’s commitment to NATO, which has been called into question by Trump’s numerous broadsides against the alliance and its members. The fast-tracked directive met several goals. It formally invited Macedonia to join the alliance. It established an Atlantic Command to be based in Norfolk, Virginia, to oversee transatlantic traffic in the event of a conflict. It included a pledge by NATO members to provide 30 mechanised battalions, 30 air squadrons, and 30 warships, to be ready for use in 30 days or less, by 2020 – the “Four Thirties” plan pushed by Mattis to get NATO militaries in shape and ready to deploy. The alliance’s members also completed a mobility agreement meant to allow military forces to move across national borders and bureaucratic boundaries in Europe – a problem that has plagued NATO forces on the continent. Officials from NATO and the US praised the final product. Jamie Shea, a NATO deputy assistant secretary general, said the agreement was “the most substantive” the alliance had reached in years. The summit was not without Trump-related turmoil however. During the event, he reportedly told NATO leaders that their countries needed, five years ahead of time, to reach the 2%-of-GDP defence-spending level they agreed in 2014 to move toward over a decade. Or, he said, “the United States would go it alone,” though he did not directly threaten to leave the alliance. Days after the summit, and just hours after meeting Russian President Vladimir Putin in Helsinki, Finland, Trump appeared to cast doubt on the collective-defence principal that undergirds the NATO alliance. He told Fox News host Tucker Carlson that he himself had asked why US troops should be used to defend Montenegro, a small Balkan country that is NATO’s newest member.